Madras Revolution: My whole life has been a lie. I'm sure that most of you have experienced something similar to what I did yesterday. I was happily reading my physics assignment (which ended up taking me 3 1/2 hours), and I suddenly felt betrayed. After reading a certain paragraph, I had to backtrack and read it two or three more times. Gasp. 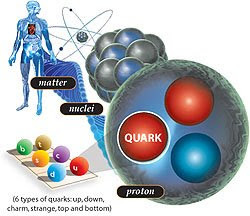 Matter was being broken down verbally right before me: from atoms, to nuclei, electrons, and finally quarks. Quarks? But Miss Mayall told me that there was nothing smaller than an electron! I went through all of AP chemistry (with an "A", I'll have you know), believing that everything stopped at electrons. I solved problem after endless problem, balanced equations and drew little structural bonds like a pro. I'm serious. If they had professional molecule-draftsmen, I could have turned in a portfolio of my structural sketches and been hired right out of high school starting with a six-figure salary. My molecules were awesome. (So awesome, in fact, that my brother Tyler, who was fresh off the mission and taking chemistry at BYU called me numerous times for help drawing molecules, figuring out where bonds were located, how to name isotopes, etc, etc, etc. He goes to Penn now). I love molecules. But I have never in my life learned about how they break down into little quarks. I have not had time to absorb quarks, their little charges, the way they are named up, down, charm, strange, top, and bottom, or think about how there is actually something a little smaller than them. Where have I been? I am not a moron. The art world has officially swallowed me. PS - I really have heard of quarks, but I have never actually studied them. Bla. Your molecules are still awesome, and te amoooooooooooooooooooo!